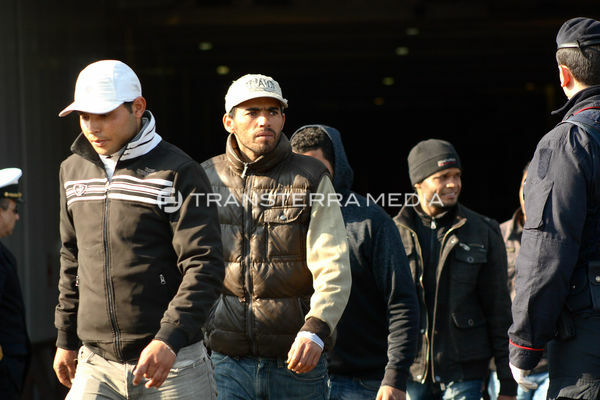 Libyan refugees arriving in the port of Taranto, south of Italy. The fighting between rebels and forces loyal to former Coronel Muammar Ghaddafi, forced thousands of refugees to flee Libya’s civil conflict by boat to Europe, and especially to Italy. In the southern city of Taranto, in the region of Puglia, the daily arrival of thousands of refugees coming illegally from Libya, placed the refugee issue as a primary concern for the italian Prime Minister of Italy, Senator Mario Monti. The picture shows Libyan refugees emerging from the cruise ship in the port of Taranto.